Another amazing night goes down in history! 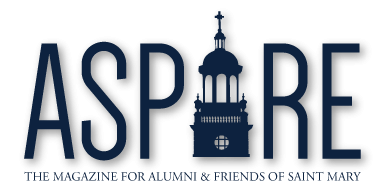 This year marked the 15th anniversary of SpireFest, the largest and only scholarship fundraiser at the University of Saint Mary. SpireFest 2018 brought over 400 guests together, raising over $260,000 for USM student scholarships. Guests enjoyed bidding on silent auction items while USM’s very own Pauly Leetz, C’92, graciously served as the emcee. Both Pauly and Joe Contrucci, C’94, served as the night’s Fund-a-Scholar and Live Auction hosts. A big thank you goes out to our Saint Mary Concert Choral for performing, along with SpireFest Superstar Sponsors. Ken Karr, long-time Saint Mary supporter and friend, was also honored as the 2018 Saint Marian of the Year. Ken has served the university tirelessly for years with both his engineering and leadership skills—and he truly epitomizes what it means to be a Saint Marian: one striving to follow in the footsteps of Saint Vincent de Paul; observing the needs of others, and figuring out a way to meet them.